How do we transfer the desired properties of bulk crystals to application-enabling thin films? Our thin film growth will provide insights into the materials challenges currently holding back this field. Currently skyrmions can only be observed in bulk single crystals, and bulk samples that have been thinned down for electron microscopy. Successful attempts to grow high-quality, phase-pure thin films have not resulted in the unambiguous observation of skyrmions. As is known from B20 thin film systems, strain is a critical, presumably detrimental, parameter for the formation of a skyrmion phase. However, strain is also the key to enhance the magnetic transition temperature. How can we efficiently and reliably generate skyrmions? How do we develop skyrmion transport devices? We must understand how an array of skyrmions can be moved along a nanostructure that forms the core of a shift-register-like system. The crucial parameter is the optimal current density required to drive a train of skyrmions. Since a single information bit is encoded by the skyrmion's presence/absence, we must study whether this skyrmion chain can be moved uniformly, without changing their relative distances. How do we develop skyrmion detectors? After exciting and transporting skyrmions, a means of detection needs to be developed. Magnetic spin-valve and tunnel structures will be studied, as well other schemes, before a recommendation will be given for the fabrication of the structures. A straightforward approach is to use the topological Hall effect (THE). Generally, however, the expected THE voltage will be rather small, making it necessary to enhance the signal. Materials synthesis will be carried out via molecular beam epitaxy (MBE) and UHV magnetron sputtering. Hitherto we have successfully grown the B20 materials MnSi, FeGe, and MnGe in thin film form. We have investigated the magnetic states in these films by magnetometry, and neutron diffraction, ferromagnetic resonance and muon-spin spectroscopy. For this project, we have four thin film growth systems at our disposal, covering the materials classes from intermetallics, to oxides, chalcogenides, and silicides. Two state-of-the-art MBE systems are located on the Rutherford-Appleton Laboratory site in Harwell, dedicated for oxides and chalcogenides. A third MBE, for intermetallics and silicides, as well as a UHV magnetron sputterer, are located in the Clarendon Laboratory at Oxford, and have been successfully used for the growth of B20 thin films. Thin films will be patterned into nanodevices in Oxford's nanofabrication cleanrooms. Photolithography e-beam lithography, and focused ion beam will be employed for fabricating a variety of structures that are optimised for their respective purpose: in-plane contact structures, Hall bars for magnetotransport studies, spin valves, and magnetic tunnel junction-like structures for skyrmion excitation and detection. 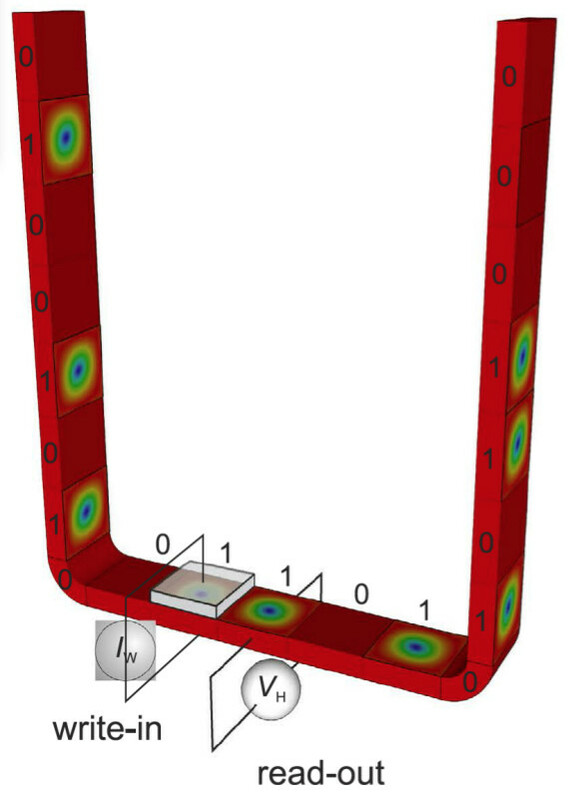 Micromagnetic simulations will be used in order to determine the optimal implementation method for the development of novel high-density, low-power skyrmion-based data storage and processing devices. The use of skyrmions in thin film devices requires them to be stable in zero external magnetic field. We will refine the finite-difference and finite-element simulation tools to cover thin films and finite dimensions, at T=0 K and at finite temperatures. Design of the skyrmion-based data storage device requires the multidisciplinary approach including micromagnetic modeling, numerical analysis, complexity, software development, and more. The simulation tools have already been fully developed at the University of Southampton. We also have access to the University's High Performance Computing Facilities, which will allow us to perform simulations by varying different parameters over a very wide range.